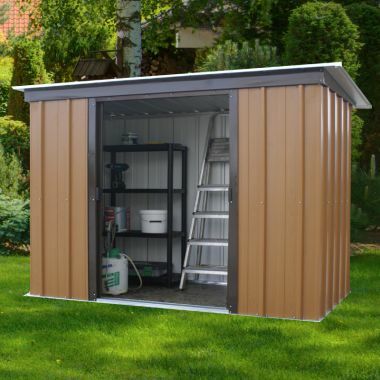 YardMaster’s weather-resistant and maintenance-free Tall Woodgrain Pent Metal Shed provides convenient and secure outdoor storage on your residential property. An elegant woodgrain finish on the hot dipped galvanised steel panels combines the warm natural look of wood with the strength of steel. A unique 15-year manufacturer guarantee against rust perforation provides our customers with absolute peace of mind. Except for the occasional cleaning, your metal garden shed takes care of itself. No painting, rust-proofing or preservative application is ever required. Do you have bulky items to store, like furniture or garden equipment? Our pent metal sheds are ideal. Spacious interiors and overlapping double doors provide easy access as well as more room for storage. Strong lockable handles, attached with anti-tamper bolts can be secured with a padlock of your choice (not provided). You can safely store your possessions on your property in all kinds of weather and without cluttering up your garden or home. YardMaster’s consistent quality has made us Europe’s no. 1 shed manufacturer. Premium quality steel with 7 layers of rust protection, robust construction and smart design offer a convenient and durable outdoor storage solution for all homeowners. Your woodgrain metal shed will provide years of reliable storage. Plenty of storage space: The spacious interiors of our tall woodgrain pent metal sheds offer additional storage space as well as easy manoeuvrability of bulky items. Overlapping double doors allow you to easily place inside and take things out. Attractive wood look: The rich wood panel look has made our woodgrain pent metal sheds a hot favourite of homeowners in the UK and Europe. They blend seamlessly into any outdoor setting whether it is a garden, patio or backyard. Extra strong: Robust construction and YardMaster’s signature quality account for the longer lifespan of all our metal sheds. Premium quality, galvanised steel is treated with 7 layers of rust protection for enhanced corrosion resistance. The unique profile makes our panels extra strong. Free anchor kit: Rust-resistant screws and a free-anchor kit are included to secure your shed to any type of surface. Ensure that your shed has a firm, level base to sit on. Maintenance-free: You never have to paint your YardMaster shed or apply preservatives and rust-proofing. There is also no blistering, cracking, splitting, swelling or warping and no damage from bugs or pests to worry about either. Unique 15-year rust guarantee: We promise to replace free of charge any undamaged panel which has been perforated by rust within 15 years of purchase. Read our YardMaster guarantee for more information. Easy 2-person assembly: Your Yardmaster shed is made for easy DIY assembly which can be completed by 2 persons in approximately 3 to 6 hours. Our well-illustrated manual provides step-by-step instructions; plus we have local helplines to provide any technical assistance you require. YardMaster’s hallmark quality ensures you will be fully satisfied with your long-lasting garden shed. We offer manufacturer-direct pricing and there is no currency fluctuation, import taxes or VAT payable on entry to worry about. A well-stocked inventory and dedicated distribution network ensures timely response to large and small orders across the United Kingdom and Europe. Should you require any technical assistance with assembly, have a question about delivery or need metal shed parts, our local helplines are standing by to serve you. Purchase your long-lasting Tall Woodgrain Pent Metal Shed directly from YardMaster.